Webb’s Service Center, Inc. was established in Greensburg in 1988. Our family has been in business together since 1974. 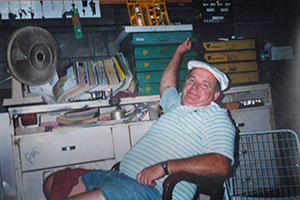 Miles Webb, Sr, our father, started the family business in Latrobe, Pa with Webb R.V. Center, Inc. After years in the trucking industry Dad decided to start selling RV’s because of the love of camping that we did as family. Dad held many sales records from 1974-1983 for the Coachmen dealership. In 1979, Miles Jr started his own repair shop behind his house in Latrobe, Pa. In 1988, the businesses & family were combined in our original location on Fosterville Road. With the sudden death of Dad in 1991, we have stayed together as a family business and have managed to grow as a company. In 2005, Miles Jr & myself purchased our current location on Old Route 119. We are committed to further growth and continued success in the coming years and family generations.